Lubrication - Maintenance Cost or Opportunity? To those in the maintenance department, precision lubrication is a no-brainer. It stands to reason that lubrication excellence is a good investment. Put simply, machines run better when they are properly lubricated. However, for those in other parts of the organization who don’t understand the nuances of elastohydrodynamic lubrication, lithium complex grease thickeners or filtration beta ratios (or perhaps don’t care! ), spending money on lubrication upgrades and improvements is simply another overhead cost. From this viewpoint, lubrication, like every other cost, should be minimized to help the organization survive in today’s ultracompetitive global marketplace. So how do we convince management that spending money on lubrication and other reliability-based maintenance improvement initiatives is a good idea? After all, we in maintenance understand that such improvements must make a difference. Surely management should be able to see the value that improved lubrication can have on equipment and productivity. 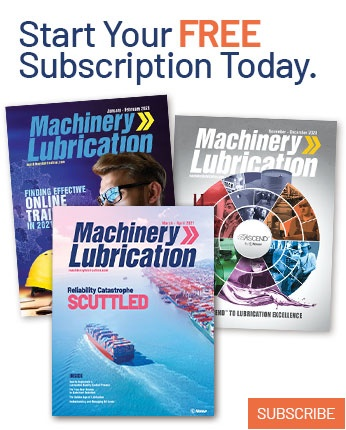 The issue is not that management doesn’t care, but rather that most managers simply don’t have the depth of knowledge about how lubrication can affect equipment reliability - beyond the last catastrophe that shut down production - to make an informed decision. Should we send our managers to a lubrication training class? Perhaps, but while there is no doubt that some education is required for management, expecting our management team (outside the maintenance group) to become conversant with the details of lubrication excellence is an unrealistic proposition. Instead, it is necessary for those in the maintenance team to become internal salespeople, convincing management that an investment in lubrication is worthwhile. For many, this is an uncomfortable proposition. Just the thought of selling something conjures up images of a used car salesman, trying to convince a suspicious and wary purchaser that the beat-up Pinto with balding tires and rusty doors is indeed a solid car. However “sales” doesn’t have to be a dirty or taboo skill to learn. In fact, most of us are selling on a daily basis. Even mundane family decisions, such as which restaurant should we eat at or which movie to watch, are in fact sales transactions. Both parties express their needs, wants and desires, and a decision is made based on the available facts. To some degree, we are all salespeople. The key to selling management is to speak their language. Just like learning to speak French will be of no benefit for a vacation in Mexico, to convey our message we must translate the language of lubrication, which is foreign to most managers, into the universal management language of dollars and cents. The key to an effective translation is to develop a solid model which outlines the issues at hand (excessive maintenance costs, lost production costs, production derating, poor product quality, etc. ), outlines a proposed solution (including estimated costs), and finally, and most importantly, estimates a return on this investment. Just like every other investment opportunity, management wants to know whether a dollar invested in this project will yield an appropriate return. Otherwise, that dollar is likely to be invested elsewhere, and rightly so. The first step is to identify the opportunity costs: those costs that the organization currently bears that could be eliminated through planned improvements. Consider a hypothetical plant where little has changed in the lubrication department for the past 20 years. Its maintenance budget has dropped by 10 percent over the last three years. However, during the same time frame, the plant has experienced some significant unscheduled downtime and production losses. Consequently, management is demanding improvements in equipment reliability. 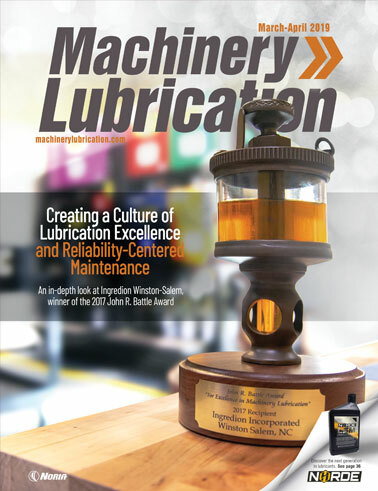 Based on articles in Machinery Lubrication and other magazines, we believe a lubrication best practices program can eliminate a significant number of equipment failures and help reduce total maintenance costs. An evaluation of the current state of the lubrication program reveals that few machines have been equipped for a modern-day lubrication best practice (appropriate breathers, appropriate dedicated filtration for all major hydraulics circulating systems, quick-connects for off-line filtration for all critical wet sump systems, oil sample valves etc. etc.). A significant investment in both time and money is required to bring upgrade equipment to modern-day best practice if we are to have any hope of significantly reducing downtime costs. Now consider the mechanics of how lubrication is performed. In addition to poor equipment configuration, basic lubrication PMs, regreasing, top-offs and decisions about machine inspections are being performed, but quantity, frequency and other task details are left to the lubrication technicians. Based on experience, we believe a number of problems were a direct result of either insufficient or excessive lubrication. We also believe that some of these problems can be resolved by a careful review of all lubrication PM activities so that both frequency and task details are based on sound lubrication engineering fundamentals, not just the lube tech’s best guess. By rationalizing our new PMs into more efficient lube routes, we also believe we can become more efficient in our activities. Finally, let’s look at the oil analysis program. Regardless of the inability to take a quality sample due to the lack of sample valves, our program is poorly designed with few if any targets and limits, and an outdated test slate more appropriate to diesel engines than modern production equipment. In summary, this hypothetical plant is in rough shape! The first and most obvious opportunity in the hypothetical plant is to try to reduce unscheduled downtime. The assumption is that some portion of these unscheduled events can be attributed to poor contamination control or lubrication practices. By modifying equipment to control contaminants while allowing best lubrication practices to be deployed, some or all of the lubrication-related failure events can be eliminated. Another area of opportunity is in right-sizing the lubrication PMs. Due to a reduced maintenance budget, we are faced with doing more with less. It is believed that by carefully reviewing all lubrication PMs for both frequency and task details, not only will we ensure our equipment is properly lubricated, but our work load will decrease by eliminating unnecessary maintenance activities (for example, regreasing a bearing every month, when every six months is more appropriate, or changing oil unnecessarily when a condition-based change is more appropriate). The question is, how can we estimate our opportunity costs from the plethora of financial, (maintenance costs and annual downtime costs), substantive (failure history or machine uptime) and anecdotal (for example we think the most recent failure was due to lack of lubrication) data available to us? The model in Table 1 attempts to account for these factors. 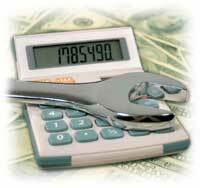 We begin by estimating, in round numbers, the current annual maintenance cost. In order to bracket the opportunity (provide a low and high estimate), we will then review the maintenance budget history to establish a low and high limit. From this history, we can now project a best case (costs are lower than expected), likely case (costs are as expected) and worst case (costs are higher than expected due to unplanned expenditures) scenarios. Next, determine the total annual downtime costs. This is where it can start to get tricky. While in some plants, this figure is relatively straightforward, varying production schedules, market conditions (not all product is sellable) and poor record-keeping can make obtaining realistic estimates challenging. In obtaining estimated downtime costs, it’s often a good idea to involve production and plant management; after all, it is these people to whom we are attempting to sell. Involving management in the process early on by providing their best guess of estimated costs, this creates buy-in and ownership in the process. It also prevents cynicism when it’s time to present the final cost benefit analysis. The “low”, “likely” and “high” case scenarios are helpful here. Where downtime costs are well known, a fairly narrow window can be selected, bracketed by the low and high cost estimates. Where downtime costs are difficult to obtain, a fairly broad window can be selected. The next step is to identify from the maintenance and downtime figures, how much of these costs can be eliminated through a well-designed, well-executed lubrication program. It’s advantageous to involve people with a vested interest in making this assessment. After all, it’s difficult to argue against a number you’ve helped to determine in the first place! It is important to itemize and consider replacement costs for both lubricated and associated nonlubricated components (shafts, housings, cages, fans, couplings, etc.) affected by failure of lubricated components. This estimate should include all scheduled and unscheduled repair work, such as replacements and rebuilds, and follow-up work for commissioning and assessment of newly deployed equipment. This is an estimate of the negative impact of current practices on lubricated components. Influences could include: incorrectly selected lubricants, too much and too little lubricant, incorrect relubrication frequency, ineffective contamination control (fairly to maintain best practice targets) and poor oil analysis practices. This can be a tricky number to estimate. However, a combination of the lubrication team’s best guess plus case study-based information from other sources can be useful in “guestimating” this number. The final cost attribute to consider is the cost of inefficiency associated with deploying a poorly designed lubrication practice. While the effect of poor design (for example, incorrect regrease frequency, volume and product selection) is accounted for in the repair opportunity costs, the wasted time and effort associated with that design must also be recognized. This value is derived by estimating the percentage of the maintenance budget associated with lubrication PMs and other lubrication-based nonrepair activities (X, including labor and materials), and then estimating the percentage of this value that is unnecessary (Y). Using the example in Table 1, it is estimated that based on an annual maintenance budget (likely case) or $13,000,000 and estimated annual downtime costs of $5,000,000, we have a total of $1,426,000 in repair and inefficiency costs that can be eliminated through a well-designed, well-executed best practices program. Once we have identified the “opportunity”, we must estimate the real cost of improvement. This estimate will include the cost to scope, design and manage the ongoing project, as well as costs associated with purchasing and installing any hardware that is necessary to bring production equipment up to modern best practice standards. The cost for training should be included in this estimate. Training allows for those who will be impacted by the proposed program to understand the overwhelming need for change. Training should be tailored to each individual’s roles and responsibilities. Everyone from supervisors to managers, operators to millwrights should be included in this training in the effort to accelerate acceptance of new standards and practices. Training courses and modules should be geared toward both fundamental knowledge development and skills-based task training, according to the type of role the employee provides. For some, web-based training offers an efficient, inexpensive way to obtain training, while for those more intimately involved in lubrication, more detailed “live” training is likely to be more effective. Going back to the hypothetical plant, Table 2 shows an example of the estimated costs associated with the proposed program upgrades. The final step in making the sale is to assess the benefits – the opportunity costs – versus the cost to develop the program. In doing so, it is customary to take a three-, five- or seven-year planning horizon and calculate a present value return, which is explained below, and to calculate the rate of return on the proposed investment. For the hypothetical example, this is shown in Table 3. Based on the calculation of opportunity costs and taking the most likely case scenario annual opportunity costs are estimated to be $1,426,000. Because this is a result of current inefficient maintenance practices and current downtime costs, we can expect to realize these savings each year that the new and improved program is in place. However, it is unrealistic to expect full benefits to kick in during the first year. For the first year, it is more realistic to place a conservative estimate of 50 percent of these savings, or $713,000. The message is simple: while the objective is to ensure the project and costs benefit analysis look attractive, we must remember to not overstate the benefits. In the second year, we typically estimate 75 percent of the annual savings for the same reasons. For years three to five and beyond, the full and compete annual savings kick in, resulting in net positive cash flow of $1,426,000 (based on the current value of the dollar) each year due to improved lubrication practices. In the financial world, the savvy investor knows that the value of money depreciates over time. Put simply, a dollar in your pocket today will be worth significantly less (have less buying power) next year and even less the following year. For this reason, the model needs to include a discount rate to allow for this depreciation factor. In Table 3, we have assumed an eight percent rate – not unrealistic – resulting in our dollar being worth only 93 cents in the first year, 86 cents in the second year, etc. This discount factor needs to be assessed against our annualized savings to provide an annual cash flow benefit for each year based on today’s dollar value base. Finally, the annual cash flow figures are summed for the five-year period to give a net present value (again in today’s dollars) of $4,083,470. This return, which is the likely return from the initial investment to develop the program, can be assessed against the original investment to develop the program. In the example, this is $485,000 from Table 2. In essence, we’re saying “if we invest $485,000 today in developing a lubrication excellence program, over five years, we should receive a return, in today’s dollar equivalents of more than $4,000,000, giving us an annual rate-of-return of 171 percent.” This is a very healthy investment on par with the High Tech rally of the late 1990s! It is not uncommon for senior management to simultaneously demand increased reliability and reduced maintenance costs. They are not seeking to be counterproductive, but rather they are asking us to work smarter, not harder. Rather than swimming upstream, constantly battling for increased funding while fighting fires with limited resources, give them what they want! Managers are paid to make sound decisions based on rational facts and arguments. Show them a structured, well-thought out financial plan to bring increased reliability and reduced cost.